Medical centers are increasingly implementing Remote Medical Care. Solutions enriched with telemedical functions used in cardiology, obstetrics, and long-term senior care are growing in popularity. But why the increased interest in technology allowing remote medical services? There are at least six reason worth noting. Remote patient monitoring can minimize hospitalization time. As a result, medical centers can support more patients in a given time, while those patients needn’t wait weeks for admission. Instead of joining a waiting list or a bed, they receive treatment in the comfort of their own home,, reducing stress, while remaining under the continuous care of specialists. Because the Remote Medical Care Center takes over of the first line of patient care, medical centre staff can catch a breath. Monitored patients do not lose the sense of safety, because they can quickly contact a specialist whenever needed. The application of advanced telemedical solutions allows the remote monitoring of pharmacotherapy, and observation of trends and change dynamics in a patient’s vital parameters. Such treatment clearly increases the percentage of patients able to receive and therefore follow a doctor’s recommendations. This results in improved treatment efficiency. Long-term patient monitoring using equipment with telemedical functions contributes significantly to improved treatment results. Continuous measurement of selected parameters shortens the response time in the event of risk to the life or health of a person using such services. The introduction of innovative services based on new technologies positively affects a medical center’s image. The renown achieved in this way can be harnessed successfully, such as for marketing purposes, to acquire new clients searching for advanced treatment based on solutions that assure flexibility and improved quality of a patient’s life. 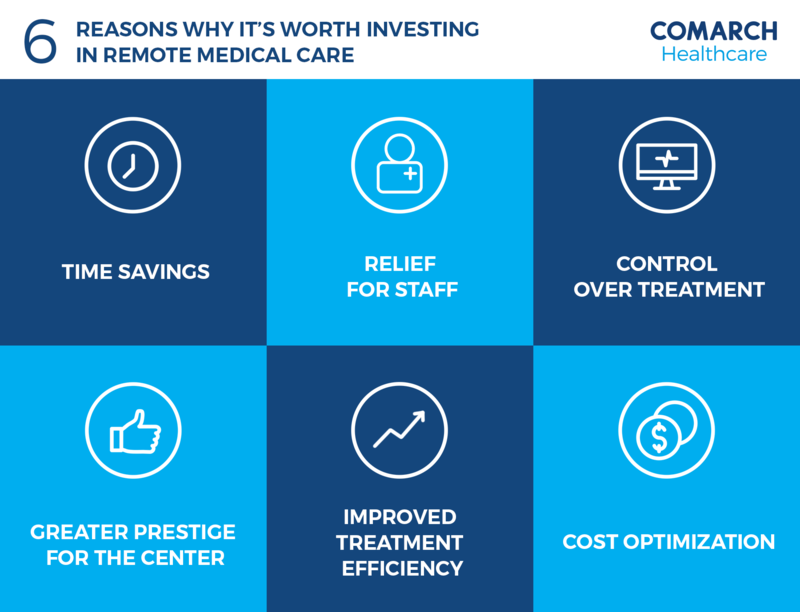 The application of Remote Medical Care in healthcare centers is an optimal solution in regard to costs. It allows rational equipment and staff management because, owing to the use of equipment with telemedical functions and advanced online communication, neither is bound to a single location. An example of such technology includes online medical conferences that allow residents of smaller towns (where contact with doctors is often limited) to benefit from professional consultations with specialists anywhere in the world. They need only access to the technical infrastructure (specialist software), and medical infrastructure (such as a remote ECG device or remote stethoscope), and the Internet.